A Year Through The Lens: Day 109 Lanterns of hopes and dreams. No matter what god we worship or if you don't. We all still hope for a healthy, happy life and our dreams to come true. Man Mo Temple in Hong Kong was built in 1848 in the early days of British Rule. Man Mo means 'civil' and 'military'. It was a temple to settle disputes when British Law could not, dating back to Qing Dynasty legal system. Where a ceremony was preformed and promise made to the gods. If it was broken by either one a curse would prevail on the one who broke it. 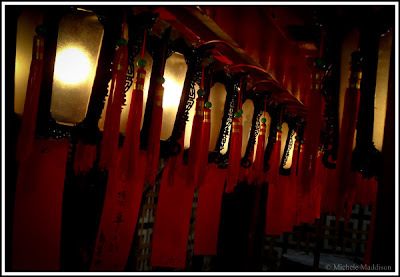 Now people come and light incense and lanterns for all sorts of hopes and dreams, read fortune sticks. The world is made up of many similar things, just speak different languages, and culture by-lines. If we were all the same where would the adventure be?